Posted in: Pro-line, Radio Control, XRAY. Tagged: RC Racing, Ty Tessmann. How is your New Year going? Are you as busy as the Tessmann family? Check out their impressive timeline. Congrats to Ty and Gord Tessmann we wish you and the First family of Canadian RC Racing all the best in 2017. Keep making us proud. Posted in: Pro-line, Radio Control. Tagged: New Releases, Ty Tessmann. If you are looking for a new 1/10 Buggy body, then make sure you check out the January 2016 New releases from Pro-Line. The Type-R Clear Body for HB D216, is the body Ty Tessmann was instrumental in designing. The Predator Clear Body for AE B44.3 will dress up your Team Associated B44.3. The 1966 Ford F-100 Clear Body for SCX10 is something that may interest the crawler crowd. Posted in: Radio Control. Tagged: RC, RC Racing, Ty Tessmann. 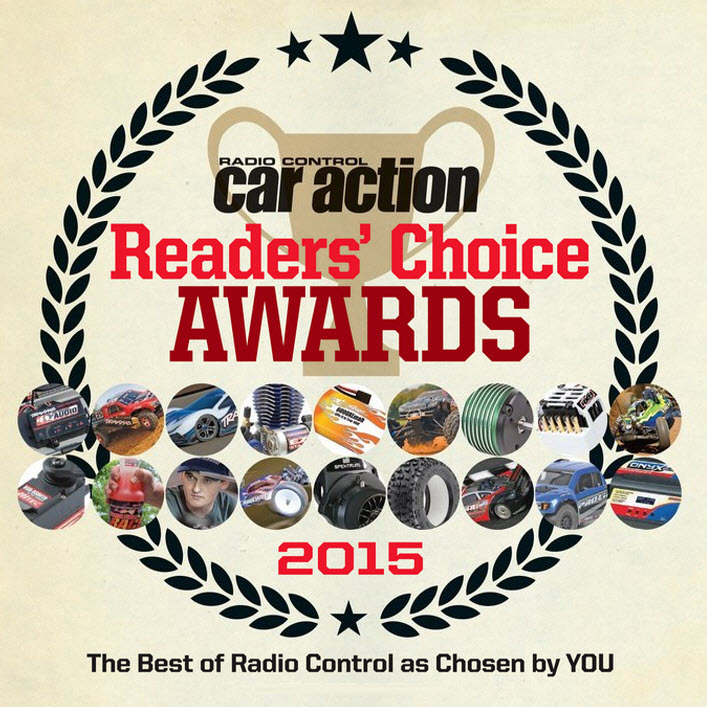 RC Car Action have released the results of the 2015 RC Car Action Readers Choice Awards. First off lets congratulate Ty Tessmann for winning favourite driver, not only can he wheel his vehicle around like no other, he seems like a classy dude and represents Canada very well. Favourite Innovation goes to Traxxas for their On-Board Audio. It should come as no surprise that Traxxas also picked up a few other awards. I don’t want to give away all the results, so to see the rest of the winners, check out RC Car Action 2015 Readers Choice Awards. Posted in: Pro-line, Radio Control. Tagged: Miscellaneous, RC, RC Racing, Ty Tessmann. Take a listen to the interview Ty Tessmann did with RC Chat. Posted in: Pro-line, Radio Control. Tagged: New Releases, RC, RC Racing, Ty Tessmann, Upgrades. The new Pro-Line 1:8 Trifecta Lexan Wing brings a huge amount of weight savings to the highest part of your buggy and massively lowers your cars center of gravity. This results in faster corner speeds and reduces the chance of traction rolling when faced with high-bite track conditions.